Mood board: Richly upholstered screens and a carpet slithering with serpents and blooming florals set the stage for a powerfully romantic Gucci show. New creative director Alessandro Michele is coming into his own at the historic Florentine house, where his vision of a more poetic, natural, eccentric, but deeply layered, woman translates into beautifully intricate, very individual, delicate clothes that somehow also manage to be light as air. If this is the new direction of luxury, sign us up please. Best in show: The workmanship was off the charts in this luxury-fused collection, leaving our jaws dropping at nearly every look. Most exquisite was the chinoiserie series that was either painted over Gucci’s formerly dusty GG canvas print (transforming a basic trench coat into cherry blossom wonderland) or embroidered into grass green tracksuits with mink trim. 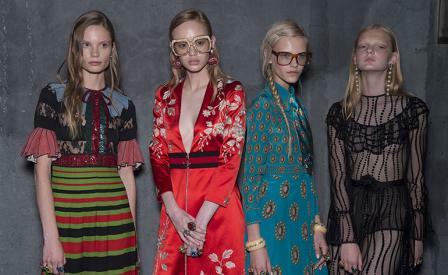 Finishing touches: Michele was formerly Gucci’s accessories designer so it’s no surprise that the accessory department has been hit with a serious dose of style steroids. Gucci’s famous web detailing (the red and green or blue and green thick striping) was transformed into cool low block heeled mules, while the flat horsebit loafer mule is now covered in an ornate embroidered silk. The best of the rest – geek-girl 1970s eyewear, intellectual berets and flamboyant chandelier earrings – all added an eccentric layer of coolness.